As we all know, deer have the ability to jump over tall obstacles with graceful ease. But white-tail deer prefer not to jump; they would much rather go under or through a fence. And when pressured they often go through high tensile fences so height is not necessarily a good enough solution; the fence also needs to be very tight so we recommend an eight feet tall woven wire deer fence as the optimal choice for fencing out unwanted white tail deer. Call or contact us today to get started. Our quotation process is simple, fast, and accurate. Our deer fence installation services will ensure your new deer fence is installed correctly to keep deer out and last a long time. It is imperative for deer fences to be installed by experienced deer fence installation professionals as there are many variables involved. The tension needs to be just right and the posts must be very secure to absorb any sudden pressure. We are proud to see many deer fences that we have installed decades ago still standing. This is due to the materials we use, the experienced personnel involved, and the deer fence installation process itself. Keeping deer out and your livestock in all starts with the deer fence installation services. Our team of deer fence installation experts will install your fence so it will last for decades. Take a look at our team installing a post for what will become a high tensile woven wire deer fence. As you can see from the video, there is a lot more to installing a deer fence than you might think. 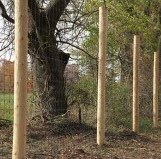 To get the deer fence installation right, the posts must be extremely strong and pounded deep into the ground. Although it is rare for a deer to run right into the fence, our deer fence installation services will ensure that it will withstand that type of impact. 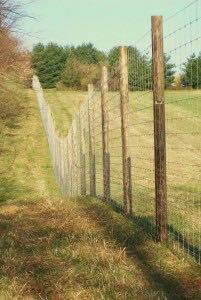 We recommend high tensile woven wire fencing to keep deer out of your property. High tensile woven wire is extremely strong. Couple that with our deer fence installation services, you are on your way to protecting your property from deer. Vineyards owners and farmers from New York to Virginia know the damage that Northern whitetail deer cause. Deer eat grapes and vines, but it’s especially problematic when vines are young and trying to get established. Read why deer fencing is your best defense against deer damage.